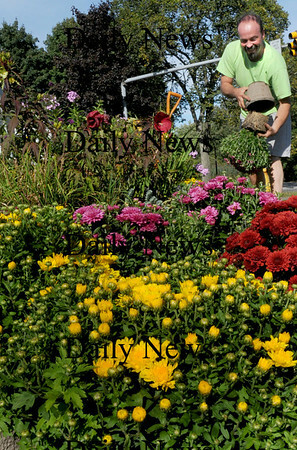 Salisbury: Doug Morris and other members of the Sea Spray Garden Club weeded and took out summer annuals in one of their gardens at Beach and Ferry Roads in Salisbury yesterday and planting mums. The group maintains five garden spots all over town. Bryan Eaton/Staff Photo Newburyport News Monday September 14, 2009.